With spring comes courting, playing and fighting in the wild horse herds. Here, two older bachelor stallions rear while the younger bachelor stallion Tall Socks shakes his head in the foreground. This is a new image taken a week ago in the McCullough Peaks Herd Area in Wyoming. 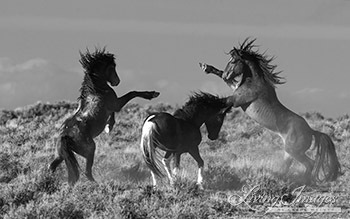 The use of black and white in the images emphasizes the dramatic lines of the rearing stallions. 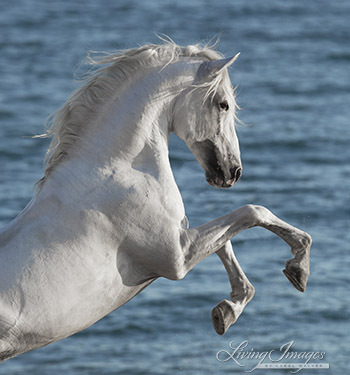 A gorgeous Lusitano stallion rears in front of the rich blue of the ocean in southern Spain in the late afternoon. In this image, the color of the sea is a dramatic background for the pure white horse.